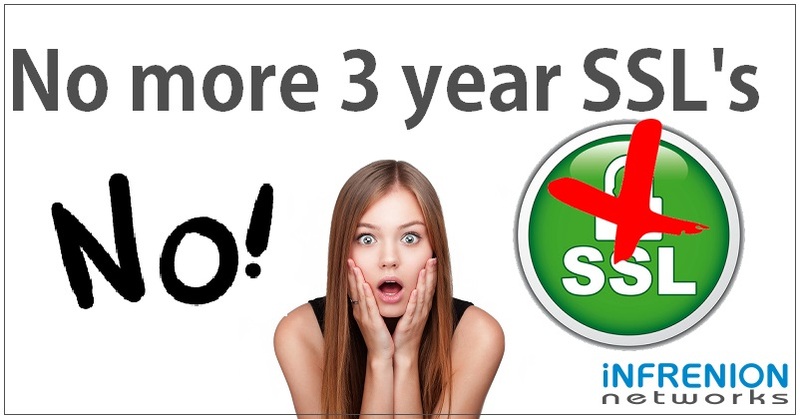 No more Three year SSL Certificates ! Recently the CAB Forum – the industry’s de facto regulatory body, consisting of Certificate Authorities and Web Browsers – voted to adopt Ballot 193. This means some major changes are coming. Perhaps most disruptively, there will no longer be three-year SSL certificates. Effective March 1, 2018, the new maximum validity will be 27 months (two years + up to three months that can be carried over when you renew early). Additionaly, business validation information will only remain valid for 27 months, after which updated information will need to be required for issuance. Last month the CAB Forum approved Ballot 193, which will see reduced SSL certificate lifetimes, as the maximum decreases from three years to two years. This is being done to address the security and logistic issues inherent with long-life certificates. Effective March 1st, 2018 all new SSL certificates will be restricted to a maximum of 825 days (2 years + 3 months renewal buffer). This affects DV (Domain Validation) and OV (Organization Validation) certificates. Prior to this date, CAs are allowed to issue 3-year certificates. Effective now (as of April 20th, 2017), validation information needs to have been completed within 825 days of the issuance/re-issuance of your SSL certificate.Because this requirement comes into effect now, there will be some inconveniences for both existing and new 3-year certificate holders who need to reissue their certificate in its last year. Available with 3 year discounted price, for a limited time..! Copyright © 2019 Infrenion. All Rights Reserved.